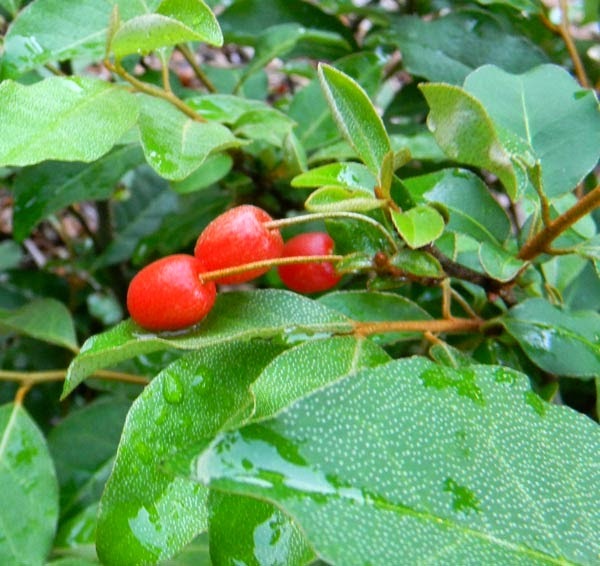 I've been asked many times about the goumi berries I grow in my nursery. Though we're sold out for this year, I'll be carrying them again in the spring. Though they don't grow as fast as their cousin the silverthorn, goumi berries grow at a decent rate and are easy to shape however you like. Here's another post I found by a gal who has plenty of nice photos and a goumi berry syrup recipe. Plant a few: they sail through our winters and have plenty of reasons why they're worth growing. ^ Apparently we have some issues with males in America too. As long as you grow goumi berries, it's all good. Males AND females who don't grow goumi berries are definitely suspect. Also there is the word "gal" in your post. Therefore Mr. Boycott or his spam-posting software figured this is a relationship blog, and thereby delivered its fascinating payload. I will say, though, that full list of attributes perfectly describes my wife, except for "drought-tolerant". She won't put up with any drought from me, even if I am Mr. Right. It works with fruits, vegetables and berries - why not people? Well the main thing I liked about her was #4. There's only room for one tall tree in this house. David, I'm in Texas so a visit to your market stall to buy a plant is out of the question. Any possibility you have seed available? No seed; however, they're apparently quite difficult to germinate. I root them in a warm mist house from cuttings. Even then, it takes about 60-90 days for them to root.